For all the evidence of early ball sports played elsewhere in the world, the evolution of football as we know it today took place in Britain. The game that flourished in the British Isles from the eighth to the 19th centuries featured a considerable variety of local and regional versions - which were subsequently smoothed down and smartened up to create the modern-day sports of association football, rugby football and, in Ireland, Gaelic football. Primitive football was more disorganised, more violent, more spontaneous and usually played by an indefinite number of players. 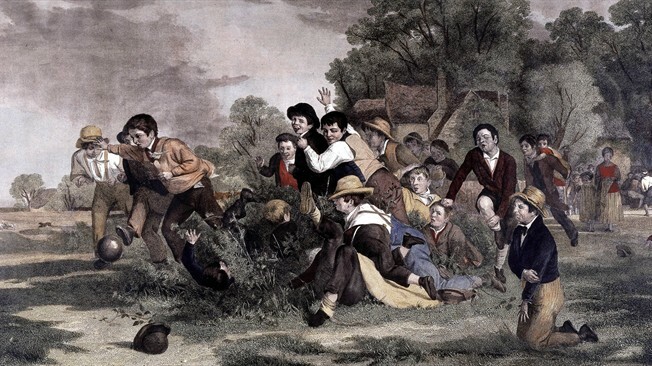 Frequently, games took the form of a heated contest between whole villages - through streets and squares, across fields, hedges, fences and streams. Kicking was allowed, as in fact was almost everything else. Sometimes kicking the ball was out of the question due to the size and weight of the sphere being used - in such cases, kicking was instead limited to taking out opponents. Curiously, it was not until nine years after the rules of football had been first established in 1863 that the size and weight of the ball were finally standardised. Up to then, agreement on this point was usually reached by the parties concerned when they were arranging the match, as was the case for a game between London and Sheffield in 1866. This encounter was also the first where the duration was prearranged for 90 minutes. Shrovetide football, as it was called, belonged in the 'mob football' category, where the number of players was unlimited and the rules were fairly vague. For instance, according to an ancient handbook from Workington in England, any means could be employed to get the ball to its target with the exception of murder and manslaughter. One theory is that the game is Anglo-Saxon in origin. In both Kingston-on-Thames and Chester, local legend has it the game was played there for the first time with the severed head of a vanquished Danish prince. In Derby, it is said to have originated in the third century during the victory celebrations that followed a battle against the Romans. Yet there is scant evidence of the sport having been played at this time, either in Saxon areas or on the continent. Indeed prior to the Norman conquest, the only trace found of any such ball game comes from a Celtic source. Another theory regarding its origin is that when 'mob football' was being played in the British Isles in the early centuries AD, a similar game was thriving in France, particularly in the northern regions of Normandy and Brittany. So it is possible that the Normans brought this form of the game to England with them. Scholars have also suggested that besides the natural impulse to demonstrate strength and skill, in many cases pagan customs, especially fertility rites, provided a source of motivation for these early 'footballers'. The ball symbolised the sun, which had to be conquered in order to secure a bountiful harvest. The ball had to be propelled around, or across, a field so that the crops would flourish and the attacks of the opponents had to be warded off. A similar significance was attached to contests between married men and bachelors that prevailed for centuries in some parts of England, and, likewise, to the game between married and unmarried women in the Scottish town of Inveresk at the end of the 17th century which, perhaps by design, was regularly won by the married women. Women's football is obviously not as new as some people think. For all the conflicting views on the origins of the game, one thing is incontestable: football has flourished for over a thousand years in diverse rudimentary forms, in the very region which we describe as its home, Britain.